Maybe it means accepting that you cannot work it out anymore. It means you can no longer go back to how you started. You can no longer bring back the warmth you used to share. The genuine smiles and stares of awe you used to exchange. The compliments, the kisses on purpose, the random sensual caresses. No matter how you try to bring it all back, even if you’ve joined forces, it just won’t work anymore. And yes, you won’t be able to easily figure out why. Maybe it means deleting all the tangible memories you have there. It means deleting all the photos, deleting their contact number and messages, disposing all the gifts, and burning all the letters. Even if your longing heart dissuades you from getting rid of them, you know you must not hold onto things that remind you of endings. Endings that leave you broken. Endings that happened for lessons. Endings that are markers of separations for painful yet significant reasons. Maybe it means rebuilding your relationship with your loved ones and yourself. It means figuring out who have been there for you all along. People who truly loved and cared for you. Maybe it’s time to focus on those you deserve because you might be busy looking for a diamond when you already possess gold. Re-evaluate everyone in your life and enjoy a good relationship quality where there is true love—not just that romantic true love—but true love in any aspect. Maybe it’s what you still need to grow and be legitimately ready for romance. And of course, re-build that relationship with yourself. Complete your life first by being independent, giving yourself everything you need and learning to be happy on your own. Maybe it means giving yourself an honorable life. It means reaching your dreams, your happiness, your definition of success. An honorable life isn’t just about having all the luxury, nor even bearing a title, but it’s also about proving something to the world by knowing and living your purpose. Because sometimes, the people that you choose to welcome in your life are big setbacks that thwart you from achieving your goals. You need to let go of them because they just bog down your progress, pretending to be with you in the climb but they’re actually breaking every rung of your ladder. You need to let them go because there is something bigger than your relationship with them waiting. Maybe it means accepting the fact that they are meant for another soul. It means being ready to see them with somebody else. Somebody that completes them. Somebody that is created for them with the seal of destiny. It may hurt. A lot. 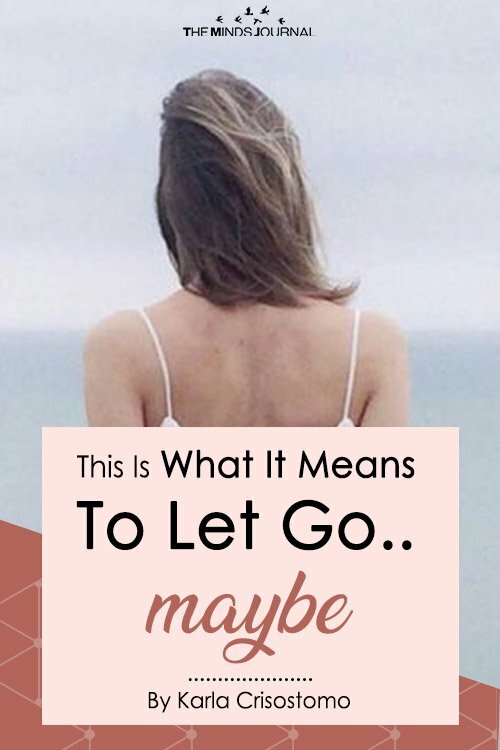 But letting go means teaching yourself to be happy for them… And for yourself as well. It means being happy despite that tingling sensation you feel once you see them in the arms of another because you know that destiny is doing its part to bring you to the soul you’re meant for. The soul that can love you the way you needed to be loved. 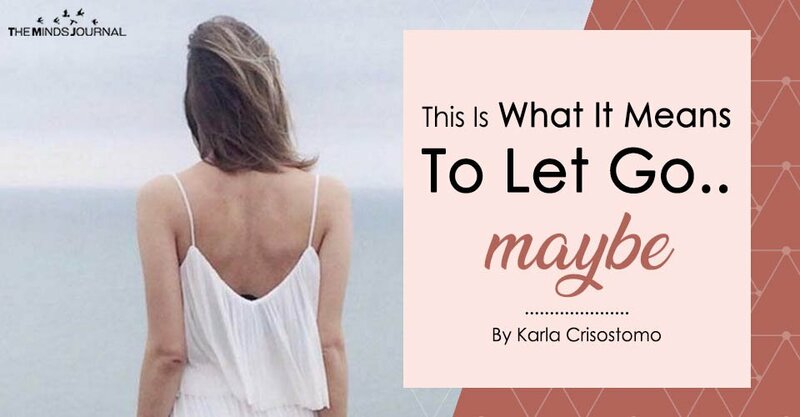 Maybe this is what it means to let go—to be eventually cool with that person without letting your past pinch a whit of your renewed heart.